stacks with lots of projectors." - Cost-effectiveness (low power consumption, compact and light weight body) compared to conventional projectors in the same class helps to dramatically reduce the costs of large-scale projection. - High brightness and high picture quality. - Multi-Screen Support System, Geometric Adjustment function and optional upgrade kit (ET-UK20) for seamlessly edge-blended images on an intricate facade. 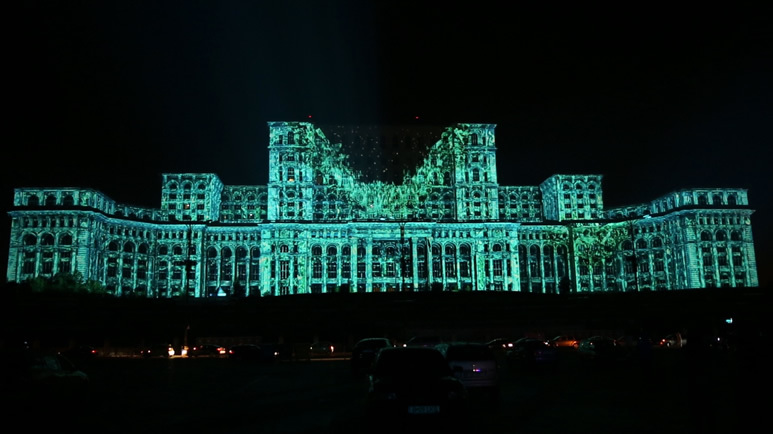 104 Panasonic flagship projectors were used to create one of the world’s largest architectural 3D projection mapping shows to celebrate the 555th anniversary of Bucharest. The 270-meter-wide, 23,000-squaremeter facade of the Bucharest Palace of Parliament was transformed into a giant outdoor theater. 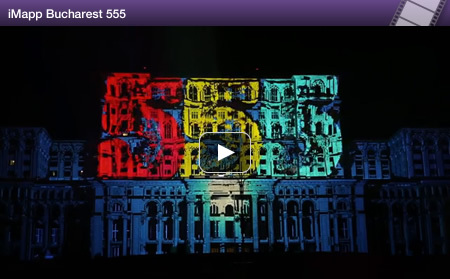 To celebrate the 555th anniversary of the first documented record of the Romanian capital, the iMapp Bucharest 555, a multimedia show including huge 3D projection mapping was planned, using the facade of the Palace of Parliament. 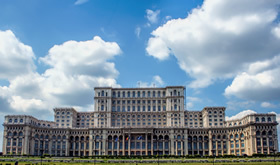 The Palace of Parliament, built in 1990, stands as the second largest administrative building in the world, second only to the Pentagon, USA. The vast symbol of communism can be seen from space and now serves as an attraction for tens of thousands of tourists every year. An impressive 104 Panasonic PT-DZ21K projectors were used to create the huge display by using edge blending and geometric mapping software to create a single seamless image. turned into a giant screen. 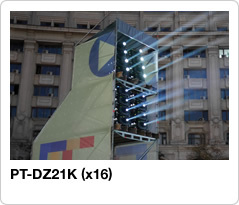 To achieve huge, 270-meter-wide mapping on the second largest administrative building in the world, Panasonic PT-DZ21K 3-Chip DLP™ projectors showed their maximum performance. Panasonic's flagship projector, the PT-DZ21K offers breathtakingly beautiful images, easy maintenance, and reliable operation. Featuring 20,000 lumens of brightness and a host of rich creative capabilities, the PT-DZ21K is packed into an extraordinarily compact body; with every feature designed and developed to meet the needs of highly critical projection professionals. "We chose the DZ21K mostly because of its size, and being so robust we were able to make stacks with lots of projectors," said Adrian Pochiscan, Technical Director of 360 Revolution, the company that produced the show. "We liked its resolution, its remote control capabilities from a distance, its stability and the fact that the projector is so energy efficient. If we had chosen another projector, we would have had to build a small hydropower plant to run the show." 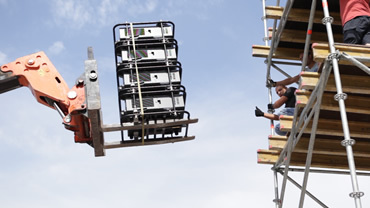 The compact and lightweight body allowed smooth installation onto high scaffold platforms. Taking a total of six months to prepare, the huge event was demanding for projection mapping specialists, MaxIn10sity. "Size matters. First of all the resolution has to be really high to get the good quality. The whole process is four times harder than for a smaller building or a normal 3D animation, it's an enormous job," said Sales Manager, Tamas Vaspori. "We were responsible for the 3D model of the building. We scanned the building with a laser scanner. When the model was ready we sent the model out to the artists and we tried to select different styles for the show." Panasonic’s Multi-Screen Support System, Geometric Adjustment function and optional upgrade kit (ET-UK20) were a great help in creating a gigantic, seamlessly edge-blended piece of art on the intricate and complex facade. By the middle of the night, the front of the palace was transformed into a giant outdoor theater and around 60,000 people had gathered to witness a historical moment. 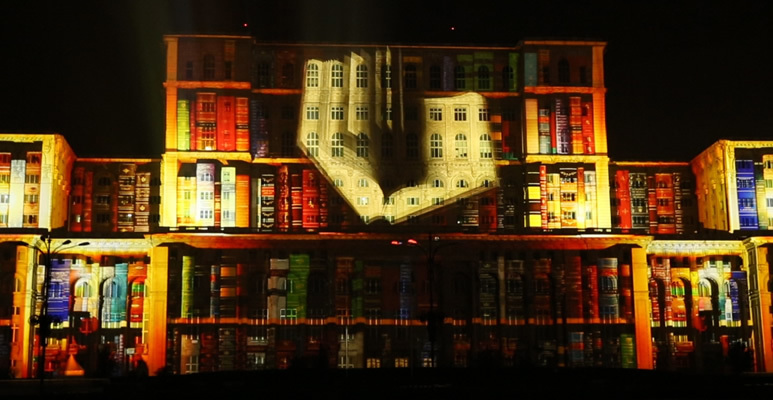 The spectacular visuals created onto the palace facade saw a host of fascinating scenes from turning the palace into a bookshelf, to the illusion that the palace itself was moving. 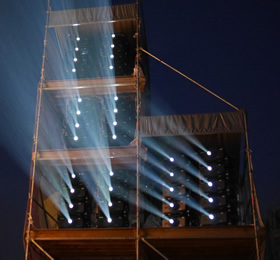 Panasonic projectors have previously been used for high profile displays at Berlin Festival of Lights in 2012, creating an architectural video mapping display on the Brandenburg Gate. 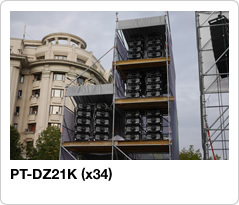 The PT-DZ21K was also used for visual displays at the London 2012 Olympic Games and Roger Waters' The Wall Live tour. 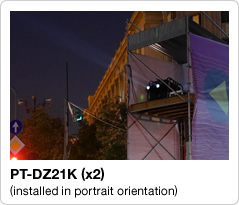 PT-DZ21K is so popular in these applications, "With this projector only two installation crew members are required to handle it, it weighs 43 kg, therefore making it easy to stack into towers. 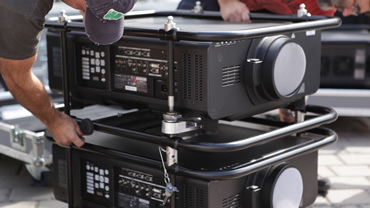 Each projector also has four lamps so, if one lamp fails, the show can go on." The projection-ray shower painted a huge canvas. This article was based on a source from Panasonic Marketing Europe GmbH.